Museum Series Gessobord™ is the most trusted pre-gessoed wood panel by artists for their work. The superior quality acrylic gesso ground does not dull colours and the wonderful lightly sanded surface provides exceptional brush control. Made with Ampersand’s 1/8" True Artist Hardboard™ and Archiva-Seal™ technology, the surface is acid-free, non-yellowing, and archival. Perfect for all painting styles with oil paints, acrylics and mixed media. Only Ampersand builds their cradles by hand with premium grade 13-ply birch plywood for maximum stability and a clean, finished look from edge to edge. Choose from 1/8", 7/8” and 1.5" Deep, all made in the USA. 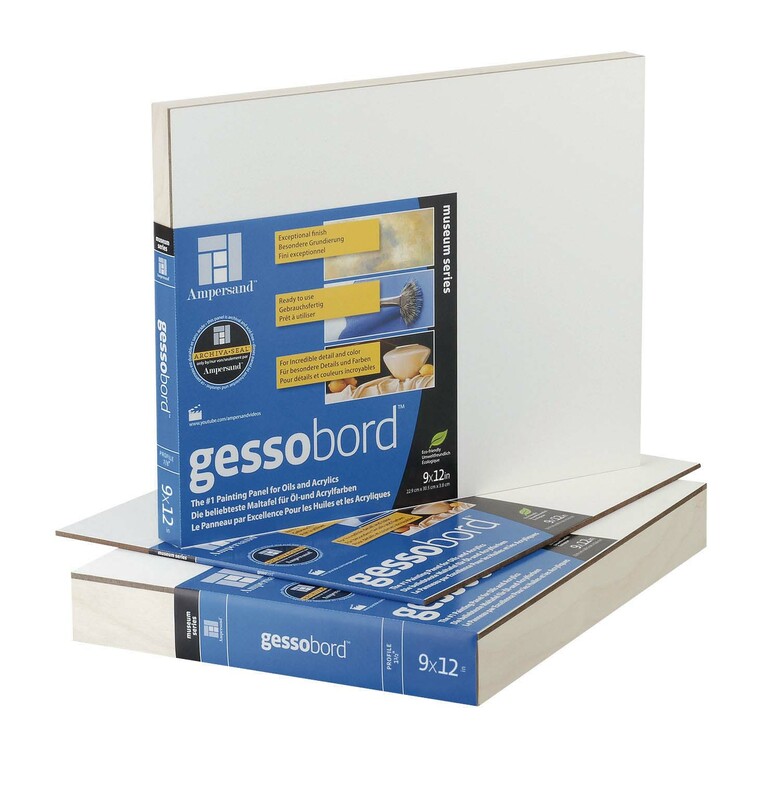 Gessobord is archival, eco-friendly and formaldehyde-free. £9.50 Gessobord 11x14 - 1/8"
£9.13 Gessobord 12x12 - 1/8"
£11.42 Gessobord 12x16 - 1/8"
£17.37 Gessobord 16x20 - 1/8"
£21.75 Gessobord 18x24 - 1/8"
£2.79 Gessobord 5x7 - 1/8"
£6.50 Gessobord 8x10 - 1/8"
£5.09 Gessobord 8x8 - 1/8"
£7.42 Gessobord 9x12 - 1/8"